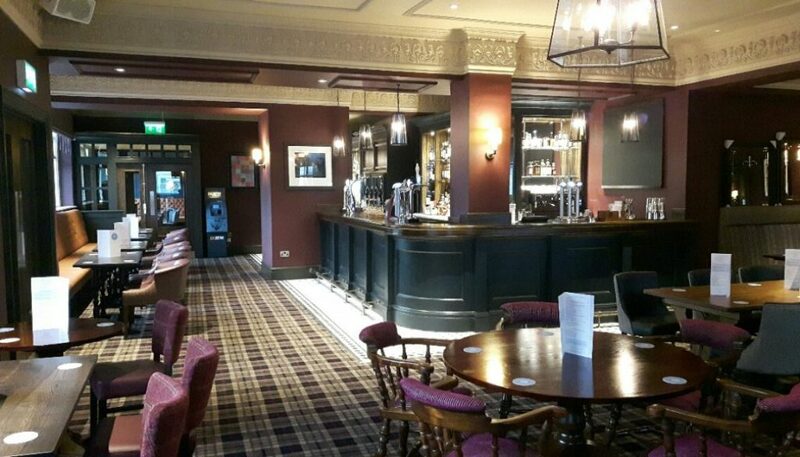 We have completed a major refurbishment of the Chillingham Arms Public House in Heaton, Newcastle. The pub is part of the Sir John Fitzgerald chain, which includes Newcastle’s Crown Posada, Fitzgeralds, The Bacchus, The Bodega and Cafe Royal. The pub, a mock-georgian two storey property built in the 1920’s, has had a huge refurbishment. Gone is the older style and instead it has had an overhaul with dark grey paint and all new signage externally which looks impressive. A nice new purple colour scheme, plush new carpets internally, and a complete new bar awaits visitors. A new commercial kitchen and cellar were installed to allow the pub to provide an A* service. The layout is better now too, allowing customers to get to the bar from the lounge – previously having to nip outside to gain access. There is also an attractive outside beer garden area for customers to enjoy in the warmer months.